If you’ve considered dipping your toe into the world of RSS readers, but didn’t know where to start, you might want to investigate the latest offering from NewsGator. 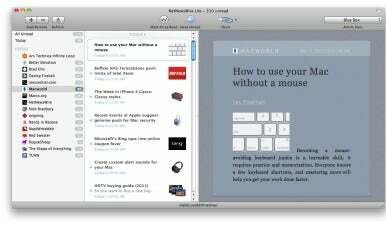 NetNewsWire Lite 4.0, a slimmed-down version of the venerable news reader, is now available in the Mac App Store as a free download. As developer Brent Simmons points out, this version is intended to be fast and light. There’s a redesigned user interface and a retooled code base under the hood, all of it aimed at making your feed-reading experience easy and efficient. You’ll find many of the basic features, such as the ability to make folders, support for importing and exporting your feeds, and sharing integration with Instpaper, MarsEdit, VoodooPad, Twitter, and more. There are a couple of additional niceties as well, such as support for multitouch gestures. But if you’re an existing NetNewsWire power user, many of the features you’re accustomed to may not be present: to wit, syncing. If you’re a Google Reader user, you won’t be able to keep all your feeds in perfect harmony with this version of the app, but don’t worry: Simmons says a full version of NetNewsWire 4.0 is on its way. NetNewsWire 4.0 is a free download from the Mac App Store, and requires Mac OS X 10.6 or later and a 64-bit processor.